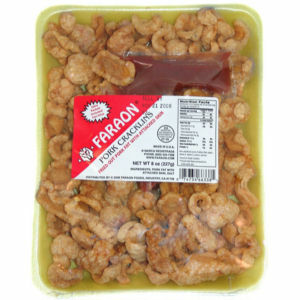 Faraon Cracklins are a great natural product. Crunchy, tasty and fresh out of the tray! Our cracklins can be used as a snack or as an ingredient for Mexican Chile Verde, Chile Rojo, or for delicious pork tamales. Puerto Ricans also use this product to make Mofongo, a popular Puerto Rican dish that also includes green boiled plantains. Our half pound size is an excellent consumer value. 080 Snack Foods, Chips, etc.